Woods is a hidden gem on the island of Martha's Vineyard. It is tucked away deep in the woods of West Tisbury at the end of the long, windy, picturesque road. 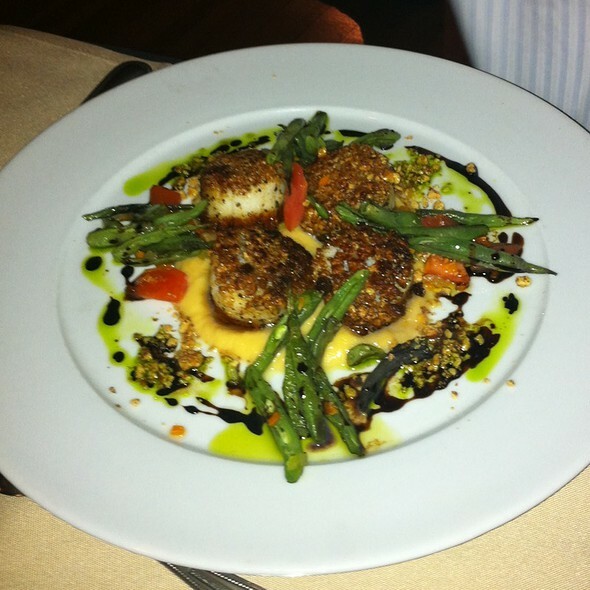 Woods offers one of the best dining experiences on the island. 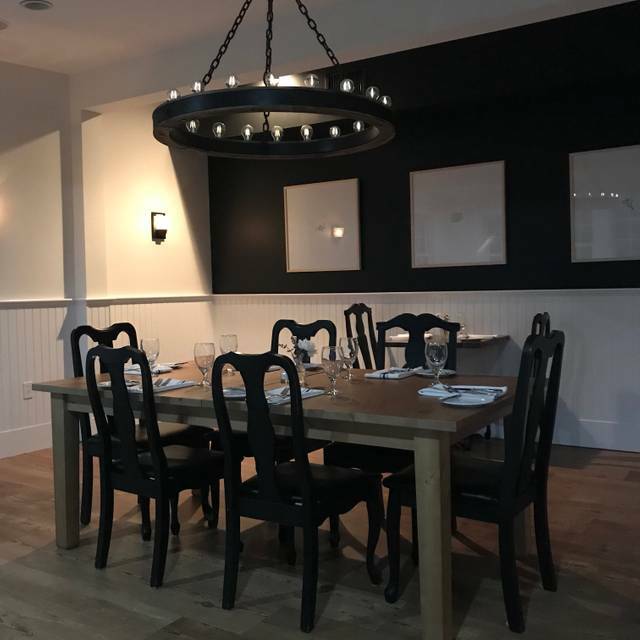 Enjoy the ambiance of restored farmhouse dining room. Our dinner menu rotates, offering the best of island fresh seafood, veal, beef, poultry, seasonal vegetables from our own gardens as well as local island farms. Also, the restaurant is no longer BYOB! Public transportation stops 1/2 mile from the restaurant. We dined here as it was close to our house. The food and service both exceeded our expectations. The crab cake first course was two generous cakes, perfectly done. Our entree was the cioppino, which contained local seafood topped by jumbo shrimp. A little under seasoned to my taste but fresh and nicely done. Our waiter and the reception were exactly right for the relaxed professionalism of the venue. Enjoyed a great night dining at Lambert's Cove Inn. Very nice ambiance, great service and good food. Would definitely return for another meal. The service was excellent. The food was very good but expensive. The surroundings appeared to have been recently refurbished, but they were somewhat plain. Overall is was a very good experience. We would recommend it for a special occasion. Striped bass, chicken thighs, and steak were excellent. Ambiance was nonexistent. Main problem was the wait staff we’re very friendly but very disorganized. One of our party has a life-threatening allergy to sesame, which we told a server about. Five minutes later another server brings a cheese platter with sesame crackers. After half an hour waiting for the wine, we had to ask for it. But, the food was great. The food was well prepared but served only lukewarm. Great great overall experience. Beautiful setting. Food was phenomenal. Service outstanding. My wife and I go to LC every year while on vacation. It is usually one of our nice dinner nights. So, we made our reservation and took an Uber to get to the restaurant. When we got there, our table was not ready; no big deal. So, they told us to “walk around” while our table was set. This was the first sign something was wrong. Upon investigation, the room that used to be the waiting area with nice couches, fireplace, décor, etc. had been turned into a snack bar / gift shop. Then they told us our table was ready and they sat us in what was essentially a spare room. This room used to be a nicely decorated library. Now it had as much ambiance as an Elks Hall. I can say that because I belong to an Elks and love the Elks. But, this was not the night we were going for. Not, when the average entrée is $39. It even had once of those service bars with the beers showing on it. You know, like they set up in an Elks hall for a function when they know the main bar will be busy. Upon further investigation, we found out the Restaurant and Inn changed hands in the spring. They are trying to make it less of a place for special occasions and more of an everyday place. That is totally fine. The new owners can do what they want. But, still having the same type of menu and chef for dinner, dinner is not an everyday place. They need to change the menu (would have told us) or find a way to keep some of that special occasion feeling for the dinner menu. In a lovely inn in the middle of MV, secluded and nice. Food was overpriced and uneven in quality. Service was good, ambiance was very good. Perfect spot for a great family friendly meal and good music. The ambiance was terrific and we really enjoyed ourselves. Great food and kind servers. The atmosphere is horrible though! So unfortunate. I gather the current owners bought the property last spring, and have done extensive remodeling. It really came out lovely! Beautiful wood floors, open floor plan, nice view to the backyard and woods. The only pick I have is the music that's piped in. Pop music mostly, and too loud. It doesn't go with the ambiance. The food was terrific. We split a Caesar Salad and Crab Cakes. I had the Haddock with fresh vegetables, my husband had the chicken thighs. Both were very good, not too rich. Dessert was Creme Brulee, also very good! Staff was very attentive, without being obnoxious about it. The hostess was very accommodating, as my husband is hard of hearing, so we needed a quieter table (i.e. no where near the overhead speakers!). We got there and it was a buffet outside by the pool. They ran out of chicken corn on the Cobb. No raw oysters clams or anything. Service was good. We had our family friends and had raved about it. Best thing was the outdoor S’mores. Also really expensive the lobster was $50. They really need to work through it as it could be great. We went to a “pop up” dinner. The food was amazing as always but apparently the place changed hands; the dining room was redecorated, as were both the entrance rooms. One of which was a lovely lounge but now resembles a dentists waiting room (complete with kids games and “modern” furniture that looked like it was from the 1970s), the other is a gift shop. We had been going for several years but will be looking for somewhere else for next summer. The traditional classy atmosphere is gone and it just feels like any other restaurant now. Our waittess told us we we seated next to the new owners who had a large party which consisted of about half the total guests at the restaurant that night, as almost all of the tables were empty. They were loud, had several kids in the group, and were mostly dressed in shorts, t-shirts, and flip-flops. Not really setting the tone for the ambiance we’ve come to expect from the Lambert’s Cove, or, for that matter, any place at which dinner costs nearly $500 for three people. I am a long-time customer of the Lambert's Cove Inn and have always enjoyed its good food and wonderful ambience. But, this summer something has gone terribly wrong. The food is the same and the service is fine but the ambience is not. We were seated in a busy room with wood tables squashed up against the wall. It felt like a lunch cafeteria and our drinks, appetizers and dinner were dispensed with in half an hour. We had a very nice anniversary dinner. The scallop dish was the favorite for a main course (better than then halibut), and the cheese spread and crab cakes were both delicious appetizers. Several of the cheeses were local, and worth tasting. Atmosphere is fine dining, in a very comfortable space (not stuffy). Plenty of light. Service was very friendly. Long time LC customer. Loved previous owners flair for atmosphere and ambiance. New atmosphere is pretty sterile, not too cozy and has little to nothing present that suggests Martha's Vineyard. The gift shop selling T's and gear was likewise unimpressive. Doubt I'll be back. Unfortunately we did not enjoy our dinner here. The ambiance is sterile, plain and noisy but the real problem was it was outrageously expensive for the quality of food we received. Crab cakes did not taste fresh, the veal cheek & sea bass were over salted and we had to return the chocolate cake (unanimous by all 4 of us as terrible.) The waiter was pleasant but never brought bread, could not accommodate a request for a mixed green salad (which is offered under the octopus), did not address the salty dishes when we told him but he did remove the chocolate cake from our bill. However, for $100/pp the meal should have been spectacular but missed the mark significantly. Excellent staff. Locally grown and raised ingredients. The staff was very welcoming and excellent dining service. We really enjoyed our dinner and it was nice to see this Inn as we have not been there in many years. I did think that it was a little noisy mostly due to the sparse decor, which I know is a ‘look’ these days but it might be nice to have simple tablecloths to lessen the clanging g of silverware and glasses on the table so not to give a cafeteria feel to the place. I am sure there are ways to give it that Inn feel without making it feel like it’s an old stuffy inn. We had a wonderful dinner. Excellent food.. loved the service. Lovely experience. 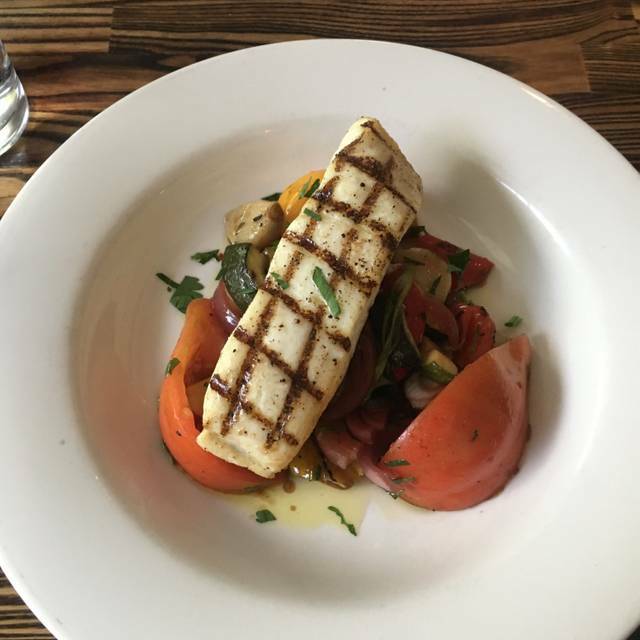 The food was very tasty and service was very accommodating but the ambience needs work. Small room is quiet and you can talk and be heard. Big room was disastrously noisy and decoratively disjointed. The tables too big for the parties. Needs to be made more cozy. Now feels like monks should be eating here. Need soundproofing, baffling, carpeting. Do not go by the pictures or any reviews older than a week or so. The restaurant has changed hands and the lovely elegance is gone in favor of starkness. We were there for Father's Day Brunch and the food was barely adequate. The quiche was tasty was stone cold. Now, some people may like it like that but NOONE likes cold toast! For the $19.95 price, it was okay. The dinner menu looks pricey and limited. But what is sad is that the beautiful ambiance of the old inn restaurant is gone. And to add insult to injury, they played load annoying music throughout. They may get better as they are very new but we were very disappointed. The Inn has undergone new ownership and has a cold feel similar to a warehouse. It is poorly furnished for an highly priced inn and restaurant. The waitstaff were unprofessionally dressed for an upscale restaurant. I had gone to Lamberts's cove for many years and have always enjoyed it until this time. I hope the new owners can get their act together but I will not be back. We dined while visiting Martha’s Vineyard and found the staff to be welcoming and friendly. We had a lovely, quiet table overlooking their pool. The dining room has been recently updated and renovated. Food was very good especially the crab cakes and steaks. We would recommend making the trip out for a memorable meal! Great evening, it was our 17th wedding anniversary and we decided to go here as we hadn't been for a while. It was as good as we remembered. Food was fantastic, service was perfect and we tried a couple great wines. Highly recommend it. Each trip to Lambert’s Cove is the same WONDERFUL! We joined two of our best friends who had not dined at the Inn. They were very empressed with the entire evening. We will return and I’m sure they will join us. 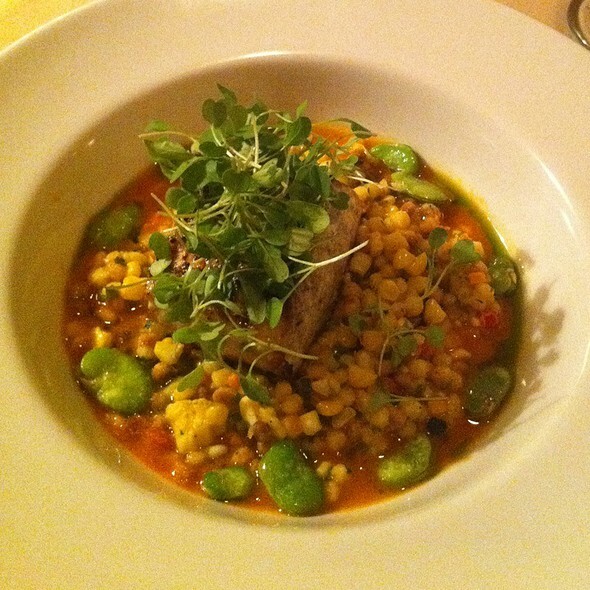 A dining experience one must enjoy when visiting Martha’s Vineyard. My husband and I celebrated our anniversary by having dinner here, and everything was perfect. 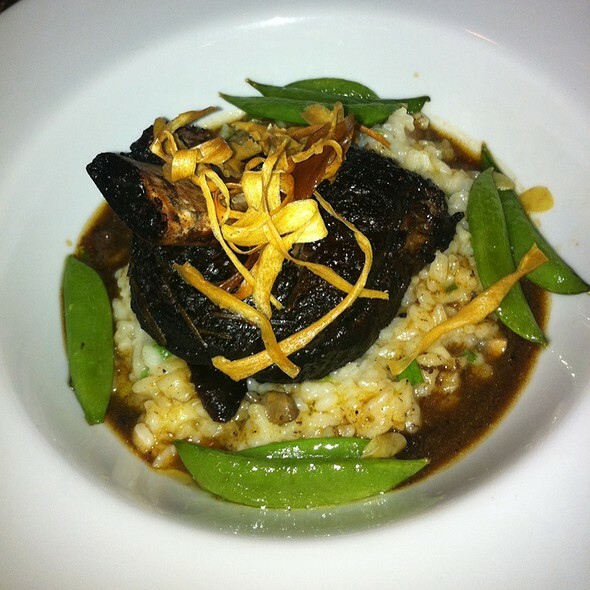 The ambiance was quiet and romantic, the staff was helpful and attentive, and the food was well-prepared and delicious. Highly recommend!! 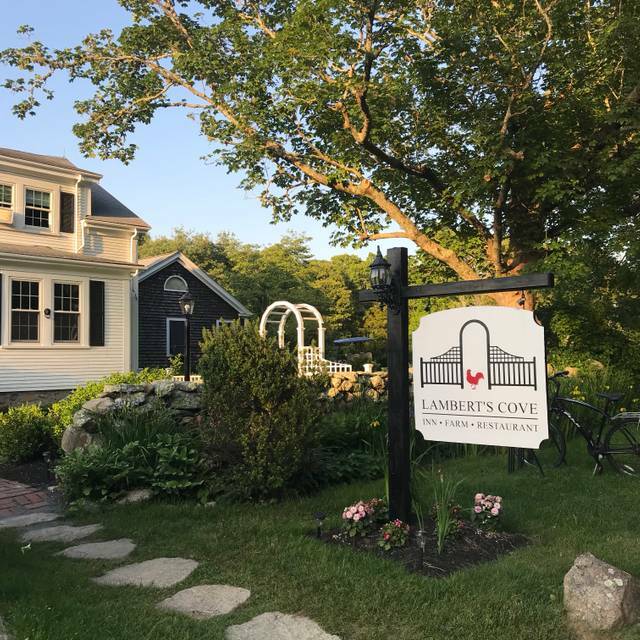 Lambert's Cove Restaurant is in a beautiful setting as part of the historic Lambert's Cove Inn on Martha's Vineyard. We were seated quickly and offered drinks (their liquor license allows only wine and beer sales). The wine list was limited, but we were offered a taste of several wines before making a selection. Our friends asked about splitting an entree and an appetizer, and we were told that there would be a $10 charge for splitting the entree and a $5 charge for splitting the appetizer (highly unusual in our experience). Although we were the first party seated in the dining room, the waiter informed us that not all menu items were available. My wife and I each had the roast chicken and the lobster bisque (both tastefully prepared) and our friends had the steak and burrata salad (mediocre at best). We did not have dessert, since our choice was not available. Overall, the dinner experience was mixed, and the food very expensive. Superb meal in lovely environs. The Portuguese pork and clams was phenomenal as were the scallops and creme brûlée. Awesome date night! Have dined at Lamberts Cove many times and have had great experiences. Perhaps it was end of the season issue. Primary disappointment related to the food. Specifically crab cakes, Ceasar Salad were sub par. Swordfish was very good and the pork/clams was good however four small clans on the plate seemed very light. Desserts were excellent as were wines. Felt as though we were being rushed out however had just returned from two weeks in Scotland where the dining experience is just the opposite we may have been overly sensitive. Always happy to be surrounded by the beauty and tranquility of Lambert Cove. Lovely setting with wonderful service. Quality of food was wonderful, but menu could use a bit of an update with some more modern choices.